2018 BMW Concept Link. Picture credits - BMW. Submit more pictures. Big city. Endless urban canyons, among which there is something new to discover around every bend. But it is also the desire for movement, freedom and the possibility to get from one place to the next quickly. With the Concept Link, a concept vehicle has now set about to combine the challenges of urban mobility of tomorrow with the opportunities of a digitalised world. Comments: Flat battery pack running along the bottom of the scooter body. Ask questions Join the 18 BMW Concept Link discussion group or the general BMW discussion group. Get a list of related motorbikes before you buy this BMW. Inspect technical data. Look at photos. Read the riders' comments at the bike's discussion group. And check out the moped's reliability, repair costs, etc. 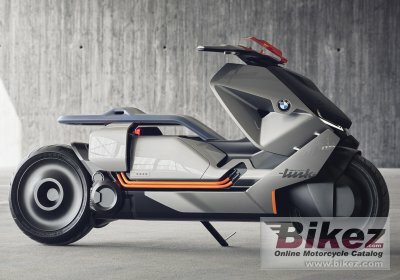 Show any 2018 BMW Concept Link for sale on our Bikez.biz Motorcycle Classifieds. You can also sign up for e-mail notification when such mopeds are advertised in the future. And advertise your old MC for sale. Our efficient ads are free. You are also welcome to read and submit motorcycle reviews.